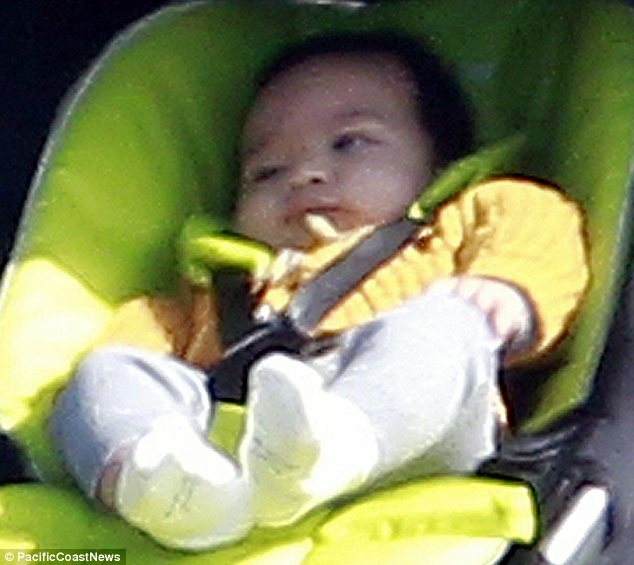 He was born five months ago and the world has been waiting for their first glimpse of Halle Berry’s baby son Maceo. That glimpse happened on Monday when the little boy’s nanny took him to visit his famous mother at work. 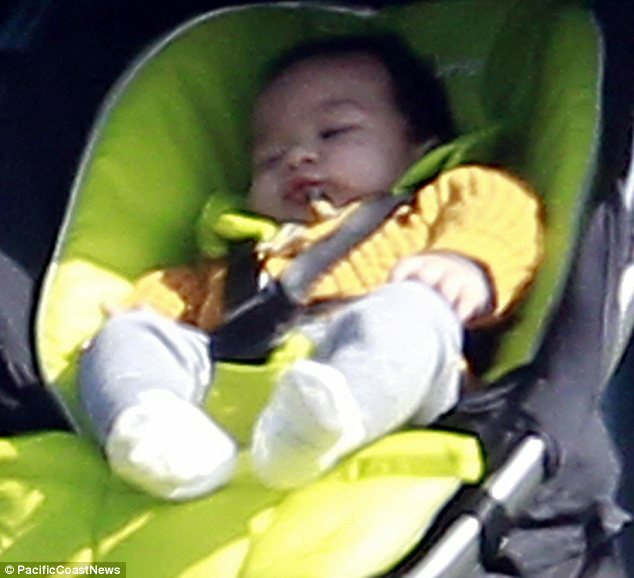 Maceo, whose father is Halle’s husband Olivier Martinez, has chubby cheeks and a head of thick black hair, and all in all is extremely adorable. The baby has an exotic heritage, as Halle has African American, English and German roots while Olivier was born to a Spanish Moroccan father and French mother. Maceo was brought to the Los Angeles set of Halle’s new TV show Extant for a visit, where the star and everyone else working on the programme promptly fawned over him. Dressed in a cosy yellow jumper, grey leggings and white shoes, it’s hardly a surprise that the tot brought such a big smile to his mother’s face. Halle, who is in great shape following the birth, crouched down to be at the same level as Maceo’s stroller and couldn’t help but coo while gazing tenderly at him. The 47-year-old was dressed casually in muted colours for filming that day, clad in a taupe jacket over a beige tank top, along with stone-coloured jeans and black slip-on shoes. It seems that the Oscar winner was shooting a serious scene alongside the boy that will play her on-screen son. Halle held onto his wrist while holding a balloon and an ice cream cone as she marched the child through a park with a frown on her face. The former Bond Girl stars in CBS series Extant, due to commence airing later this year, as an astronaut who struggles to readjust to life back home after returning from a year-long mission in space. It was announced last month that her scientist husband will be portrayed by ER star Goran Visnjic, while West Wing alum Michael O'Neill has also been cast as a former astronaut. 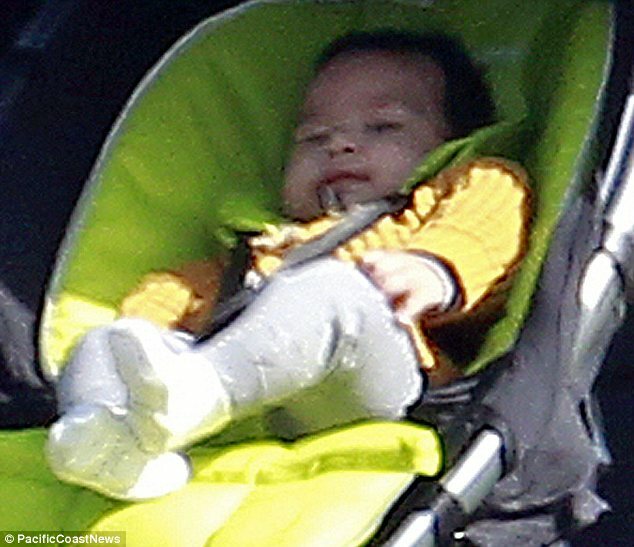 Maceo, whose middle name is Robert, is a first child for actor Olivier and a second for Halle. The star, who is on her third marriage, has a daughter named Nahla, who will turn six next month, from her relationship with model Gabriel Aubry.